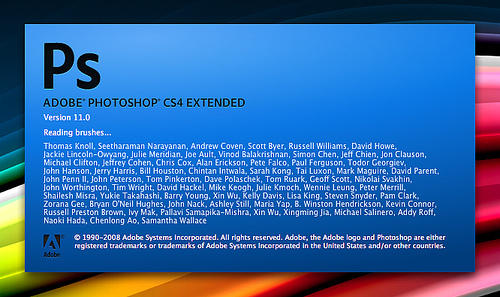 Adobe Photoshop CS4 is the latest upgrade to the Photoshop line. You might think that the CS3 version is already very comprehensive, but Adobe has managed to come up with new features. More than just minor updates, this version is packed with new and enhanced features reprogrammed to be faster and more efficient. The whole package loads up very quickly and feels snappy. It comes with a revamped interface, but the layout isn’t a lot different from CS3. You’ll still find your favorite tools in the usual places. There are just some modifications. For example, the main bar on top of the window now contains the common tools such as selection, zoom, and rotate for easier access. Adobe Photoshop CS4 also supports OpenGL for better 3D performance. You will see new additions on the right hand side of the screen – the mask panel and adjustment panel. The mask panel is where you will find common masking tools for pixel and vector masks. The adjustment panel is where you will find layer adjustment tools to adjust the brightness, contrast, exposure, and etc. You can now rotate the image while editing without affecting the final image. This new feature is especially convenient when you use a graphic tablet for drawing. The OpenGL integration makes zooming through images smoother. Even at the highest zoom settings, you can still make fine adjustments. Resizing photos is also easier. A new feature called content-aware scaling lets you resize photos with very minimal change or distortion to the image. You can even specify the scaling reference point and the area to protect. And of course, the existing features weren’t left out. They were also altered for improved performance. The clone stamp tool now efficiently shows a preview of the pixels to be copied. You can also see a preview of the brush size and easily switch to other sizes. The auto-align and auto blend function have also been enhanced so the pictures you compile come out very smooth and well-blended. You can now turn a bunch of similar pictures into 360-degree panoramas. The camera raw plug-in has also been improved. Similar tools found in Lightroom 2.0 can now be used in Photoshop CS4 and Bridge. You will have quicker and more intuitive ways of processing these large, unadjusted files. Adobe Photoshop CS4 is not just upgraded with improved functions, it comes with new core features that puts it on top of its game. This remains the digital photo software to beat.